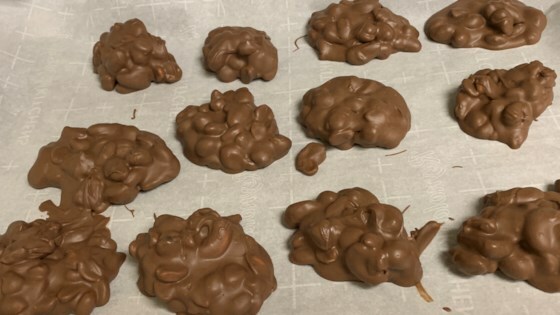 "This recipe makes 28 amazingly sweet and crunchy clusters of delicious chocolate-covered peanuts!" Place almond bark in a slow cooker. Stir occasionally on High until mostly melted, about 2 minutes. Reduce heat to Low. Stir in chocolate chips until mixture is completely dark, about 30 seconds. Add peanuts. Drop a spoonful of the peanut clusters onto a parchment paper-lined countertop to test if they are thick and chunky. Mix in more peanuts and chocolate chips if the mixture is too loose and runny. Line 4 to 5 baking sheets with parchment paper. Lay spoonfuls of the peanut clusters on top using a melon baller. Allow to harden, about 1 hour. This makes lots and lots of peanut clusters, so be sure to clear off some counter space before hand. The peanuts should harden in about one hour, depending on how big you make them.